Led by Capital stars Chris O’Hare, Josh Kerr and Cameron Tindle, Scottish Athletics enjoyed a memorable weekend abroad. The Edinburgh AC trio were at three different venues, O’Hare in Belgium, Kerr in Sweden and Tindle in Colombia. 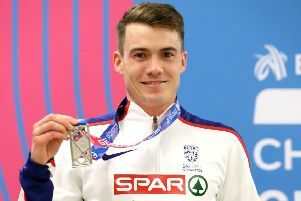 O’Hare clinched his place in the British team for the World Championships in Beijing next month with a typically gritty performance to win a 1500 metres in a personal best time of 3:34.83 at a European Permit Meeting in Heusden. The 24-year-old Peebles High FP was no doubt fired up by an organising muddle which landed him in the B race while his close English rivals Charlie Grice and Lee Emanuel were in the A race. British champion Grice clocked 3:35.29 for second place in the A race with Emanuel back in eighth place in a still fast 3:36.55. At the same meeting, Scotland’s Steph Twell clocked 15:14.39 for fourth in the 5000m which should clinch her China place. George Watson’s schoolboy Josh Kerr, 18, once again demonstrated his great tactical awareness as he swept to victory in the European Under-20 1500m final in Eskilstuna in Sweden. Only eighth at the bell, Kerr timed his finish to perfection to pip Frenchman Baptiste Mischler and win in 3:49.62, with fellow Brit Robbie Fitzgibbon sixth in 3:50.67. “It feels so good, I’ve been looking forward to this moment for a long time” said Kerr. Pitreavie’s Jack Lawrie narrowly missed a medal in the 400m hurdles, finishing fourth. In Cali, Colombia, Cameron Tindle finished third in the third 200m semi-final of the World Youth Championships in 20.99sec which took him into the final as the faster of the two fastest losers. Tindle had just seen fellow Scot George Evans (Inverness) take the discus bronze medal with a superb throw of 60.22m. Former Capital hammer thrower Mark Dry was another to excel, reaching 76.56m, his second best ever, at the Loughborough Invitation Meeting, which should also clinch his Beijing place.